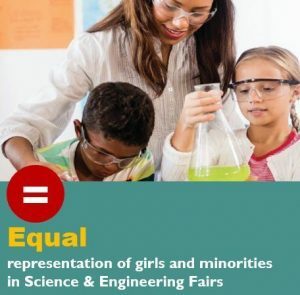 Annually, 22 Million girls and 17 Million minorities don’t have the opportunity to participate or don’t have an effective support structure & resources to succeed at Science & Engineering Fairs. Join us as we address inequities in STEM support, resources, and access to enrichment opportunities that fall along gender, racial and socioeconomic lines. Students – particularly girls – decide by 3rd grade whether they are capable or incapable in Science, Technology, Engineering, & Math (STEM), while elementary school teachers have the greatest need for support and resources in this area. We inspire students to connect with science, technology, and engineering behind things in their everyday lives. Then we bring them into an inclusive and skills-based framework of Science & Engineering Fair. From there, we empower them to design and lead authentic projects all around these things that inspire them so they can achieve success. We provide positive and effective STEM experiences to the untapped talent pool of girls and minorities early in their education through Science & Engineering Fairs.